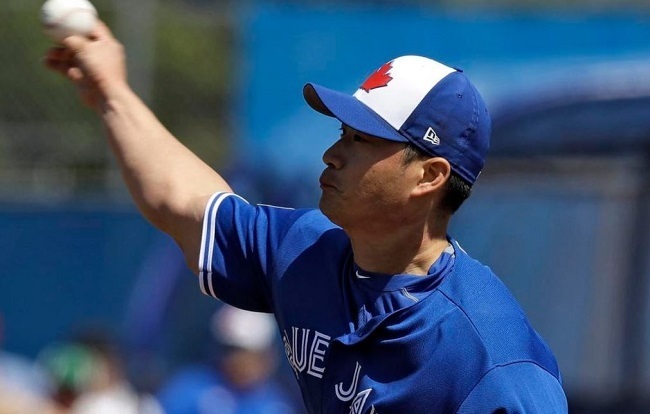 South Korean pitcher Oh Seung-hwan has thrown a perfect inning in his spring training debut for the Toronto Blue Jays. Oh made quick work of the Philadelphia Phillies in the top of the fifth inning at Dunedin Stadium in Dunedin, Florida, on Wednesday (local time). The right-hander took the mound with the score knotted at 2-2 and went up against the heart of the Phillies order. No. 3 hitter Maikel Franco popped out to the catcher to begin the inning. Then Carlos Santana grounded out to third. Oh then struck out Aaron Altherr on three pitches for a breezy, seven-pitch frame. The game ended in a 7-7 tie. Oh signed a one-year, $1.75 million deal with the Jays on Feb. 26, but he didn't get his US visa until Tuesday. Because he hadn't been allowed to appear in spring training games until Wednesday, Oh had been limited to bullpen and live pitching sessions. He's expected to join the likes of Ryan Tepera, Danny Barnes and Aaron Loup in the Jays' bullpen and set up for All-Star closer Roberto Osuna, who has 95 saves over the past three years. The Blue Jays have seven spring training games remaining, including some split squad games through next Tuesday. They'll stay in Florida through Sunday, and their final two spring games, against the St. Louis Cardinals, Oh's former club, will be held at Olympic Stadium in Montreal on Monday and Tuesday. The Jays will open the regular season at home against the New York Yankees on March 29. Oh had a deal fall through with the Texas Rangers earlier in February over what US reports said were "concerning issues" with his right elbow. But the 35-year-old has said he has "no problem at all" with his pitching arm. In 2016 for the Cardinals, he went 6-3 with 19 saves and a 1.92 ERA in 79 2/3 innings over 76 games while recording 103 strikeouts against just 18 walks. He took over as the closer midseason. But Oh struggled last year, going 1-6 with 20 saves and a 4.10 ERA in 59 1/3 innings over 62 games. He only struck out 54 batters while walking 15 as his opponents started making more contact.